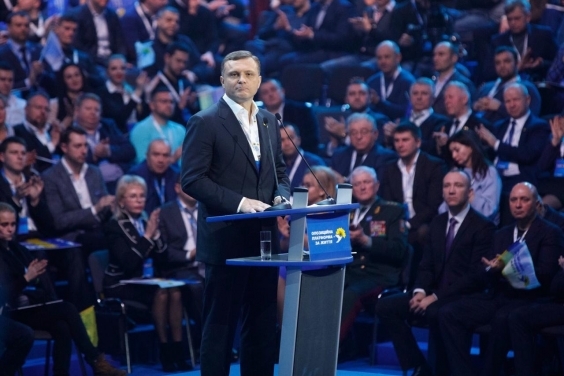 The sole political party that is able to bring peace and prosperity to our country is OPPOSITION PLATFORM — FOR LIFE and its candidate Yurii Boiko, MP Serhii Liovochkin stated in his speech during the all-Ukrainian emergency convention of OPPOSITION PLATFORM — FOR LIFE. “We are the largest opposition party in this country. The party that is able to bring peace, bring efficient state governance, bring results. Able to move Ukraine forward and make people’s life better. This is what we’re going to do in upcoming years,” Lovochkin said. “We are the only real Opposition. All those who are calling themselves opposition had joined the parliamentary coalition back in 2014; the coalition in full, and all its members, bear responsibility for the situation in the country. Even those who are calling themselves opposition now. All political forces that oppose us today have been part of the government and are responsible for the current state of affairs. “We’ve been consistent in supporting peace for Ukraine since 2014. We’ve been offering peace plans that the government hasn’t had a need in since 2014. And it hasn’t done anything since then in order to bring peace and prosperity to Ukraine,” Lovochkin added. “Our opponents are those who are afraid of us. They are afraid of our power, our mightiness, and the truth in our actions. They are acting government; they are poverty, war, destruction. And I am certain we will defeat them,” the politician said. Lovochkin says that the opposition’s current opponents include some of its former allies. “They are the people who, unfortunately, got involved in cooperation with the government. Their current activities, their fake projects aim at a single goal: to help the current government remain in office. Their task is to steal electorate from us. However, I am certain they will fail. People know who the real opposition in this country is; they know which politicians are able to bring peace and prosperity to the country. It’s us, it’s our team, it’s the OPPOSITION PLATFORM — FOR LIFE, it’s our candidate Yurii Boiko,” Lovochkin stated. The opposition politician said those millions of Ukrainians who support OPPOSITION PLATFORM — FOR LIFE are the friends of the opposition. “They are millions of Ukrainians who want to live in the modern and prosperous country. Our obligation as the political avant-garde of these people is to give them this possibility. We must win, we must make life in this country better, we must make our country better,” Lovochkin said in his speech. “Our goal is to build up our mighty political power. Our goal is to win the upcoming elections, this year and following years. We must come first in the national parliamentary elections. We must come first in local elections, especially in the regions where people need our support the most. And, of course, we must win the presidential election. We have a strong, wise, and honest candidate. We have an experienced candidate. It is a man who can make Ukraine better — Yurii Boiko. Not on his own, but with his team, with all those who are present here today and all those who are not but still belong to our team,” Lovochkin summed up.